Top speed of about 62 mph engine typedrivetrain: Overhead-valve, 4-cylinder displacement 1,595 cc (1.6 l) power rating 50-55 hp transmission 4-speed manual chassis: Semielliptic leaf-spring suspension; Recirculating ball steering; Drum brakes; 2,604 lbs. Long-running stand-in maurice wilks, head of engineering and brother of managing director spencer wilks, decided the company should build a fourwheel-drive utility vehicle to meet a need in rural areas. But there were no big plans for the land-rover: It was considered a stopgap to occupy unused factory space until postwar recovery allowed production to expand. Nearly 50 years later, the stopgap is selling better than ever. p3 powertrain the first version of the land-rover received its 1.6-litre, 4-cylinder engine and other mechanical components from the p3 sedan. Designed by engineer gordon bashford for sturdiness and rigidity, the land-rovers chassis was an important factor in its success. Because rover had neglected export markets in the past, it was unable to gain a sufficient allotment of steel from the government and relied on aluminum alloy for the body panels. A station wagon was added to the line in late 1948, and a metal top became available as an alternative to the canvas roof in 1950. 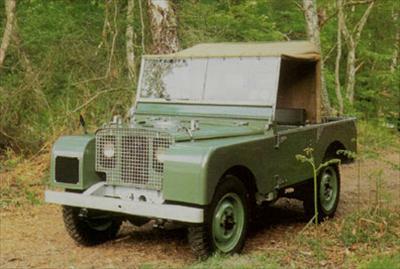 The earliest land rover was a founvheel jeeplike vehicle. Rover executives had no inkling it would still be in production 45 years later.